EOPP aims to increase opportunities for homeownership in neighborhoods with large concentrations of vacant properties. The majority of the Land Bank's real estate acquisitions are in economically distressed neighborhoods where most residents are people of color. For decades, these neighborhoods have had disproportionately low levels of homeownership, created in large part by discriminatory housing practices dating back to the 1930s. A recent analysis by the Urban Institute on the gap between white and black homeownership rates in the 100 American cities with the highest number of black households found that the City of Albany has the second widest gap of all cities included in the study. 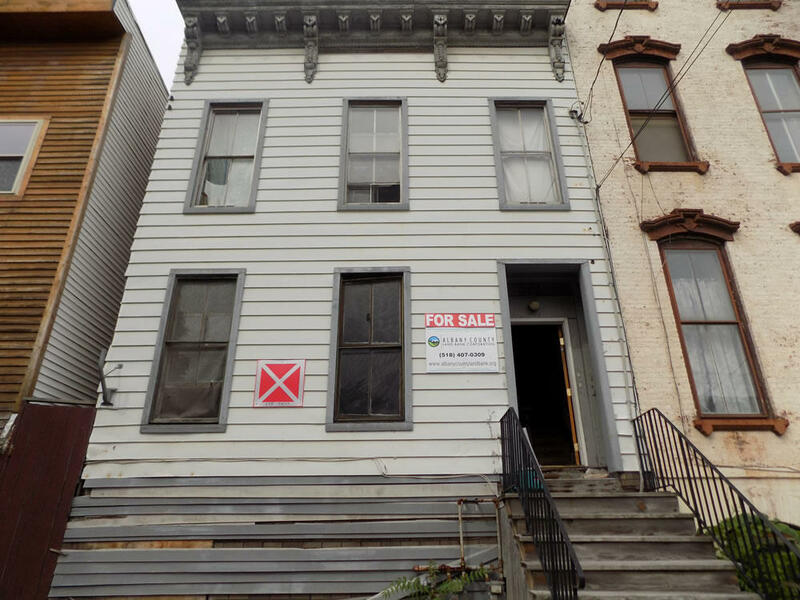 The initial phase of EOPP consists of five single or multifamily residential buildings located in the City of Albany. Buildings selected for EOPP are in economically distressed neighbors and require a low to moderate amount of rehabilitation relative to other properties in the Land Bank's inventory. Future phases of the program will be expanded to the cities of Cohoes and Watervliet, based upon property availability. Under the program, qualified applicants will receive a 15% discount off the listing price or a seller's concession of equal value to support the rehabilitation of a participating property, along with reduced closing costs. Buyers will be paired with a "Rehabilitation Mentor" who will assist with creating a redevelopment plan and provide support during the rehabilitation process - from kickoff to close out - which typically takes 12 months. Buyers must provide evidence of sufficient financial capacity to complete the rehabilitation project prior to purchasing a property and will be paired with available resources if applicable. Qualified applicants must be a first-time homebuyer with a household income between 50% and 70% of the area median income for Albany County, depending on household size. To be eligible, applicants must either currently reside in or relocate to an EOPP neighborhood. All applicants will be required to complete homebuyer education courses as part of the program. The program's income eligibility limit for one person is $42,300. The website lists the properties that are included, along with a bunch of other details. And there's a community event this Friday, June 29 at 333 Clinton Ave from 3:30-6 pm at which the land bank will be answering questions. And Kizzy Williams, the owner of Allie B's Cozy Kitchen, will be a guest speaker. "Buyers must provide evidence of sufficient financial capacity to complete the rehabilitation project prior to purchasing a property." "Qualified applicants must be a first-time homebuyer with a household income between 50% and 70% of the area median income for Albany County [roughly $30k - $40k / year]"
Good luck with that, Albany. 2) Buy a home that needed only some work to be livable, but was livable, but I could not get financing for the DIY work. Then I got engaged. And when I went to AHP to explain my household income may change before I bought the house, I was told that I'd likely be out of the program if I got married because together we'd be well above income qualification limits. This program is razor thin. You've got to be poor enough to qualify, yet have enough cash to swing downpayment, closing, rehab costs, and pre-paids. Then, you've got to hope that you don't income qualify out on the upper end or loose your job (fragile at the bottom, isn't it?) and be in default - which is part of the reason we ended up in the mortgage crisis to begin with. It just doesn't seem to me that home ownership is for everyone. And for those people with means, but on teetering on the edge of choosing a city rehab or a suburb starter home, there's NO program for them to buy in. I think that's the market Albany really needs to be targeting. Social justice, or a successful program: choose one, choose wisely.